28 neodymium magnets which develop a power of 2400 Gauss each to promote healing and reduce swelling. Magnetic energy stimulates the production of Elastin and Collagen, which are essential elements for rebuilding tissues. The Magnetik Stable Boot EVO can be worn 24 hours per day and can be put on damp or wet horses legs. We recommend them to be used after work. In 24 to 48 hours, you can see how they can affect the horse's leg. The boot helps the blood circulate which makes the horse's leg thinner. 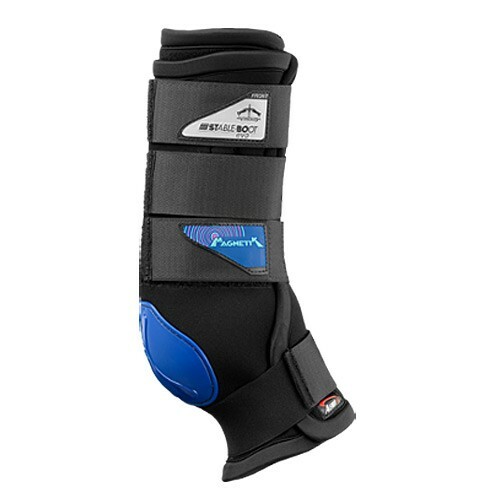 The stable boot features a breathable HCL foam (AEROX), DFD (Dry Fast Dry) interchangeable under bandage attached by Velcro®, polyurethane fetlock protector, wide and secure Velcro® brand fastener closure straps, and elastic bottom strap to reduce stress on the boot as the horse stands up or lays down. Made in Italy. Please consult your veterinarian before beginning any magnetic therapy treatment.